Showing results for tags 'yellow eyes'. I'm back everyone! 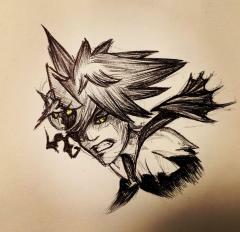 This time with a quick fifteen-minute ink sketch of Sora. Happy Early Halloween, everyone! Lately I've been doing five-to-fifteen minute sketches a day. If anyone wants to see a particular sketch, let me know! In Another Side, Another Story - Deep Dive, the one time we see Roxas's eye, it's yellow. In DDD, Young Xehanort said something about Roxas being a worthy candidate for a Xehanort vessel before becoming too aware of himself. This leads me to think that Roxas was beginning to become a Xehanort, like with Saix and Xigbar. If Roxas did become a vessel for Xehanort...Sora wouldn't have woken up, and Xehanort wouldn't have anyone to stand in his way.